Charles Ehin takes a look through the course of human history to explore what we can learn about organizational sweet spots. After having written a book and several articles about the vital importance of an organizational sweet spot to the success of a venture, I thought it appropriate to put the subject into a historical perspective. In order to accomplish that I provide a general overview of the relationship between free and restricted information flows and corresponding expansions or contractions of societal organizational sweet spots. More precisely, I track a historical timeline offering a macro perspective as to how information has been shared over the course of human history and its effect on different cultures. I conclude with the current Digital Age assessing what we “may” have learned from past revolutions and how that could help our social organizations enhance their innovation dynamics. A quick review of what an organizational sweet spot is should be an appropriate starting point. It’s important to keep in mind, no matter what the circumstances, that social systems spontaneously self-organize into groups through the interactions individuals have with each other. These interactions create opportunities for each person to gain a stronger sense of their identity in relation to other people who are, in turn, also involved with gaining a better perspective as to who they are. Hence, there is a constant circular-causality among individuals within any social setting. Consequently, people need freedom to explore and interact with individuals who are part of their immediate surroundings in order to find their specific footing regarding their unique talents, skills and experiences. Discovering what roles they can meaningfully play in varying social settings is an important continuous effort for everyone. With that in mind, we can better understand why so many people are dissatisfied and disengaged at their places of work. The rigid ”formal” top-down structures still imposed on organizational members by most businesses restrict the freedom of emergent relationships. Thus many potentially beneficial associations will not have a chance to form because artificial barriers prevent them from taking place. As a result, innovation and productivity suffer. Accordingly, the more people are given a voice and implicit control in accomplishing their work, the more they will understand and respond positively to formal organizational initiatives. Also, in the process the informal networks will begin to function more in the open and start making appropriate connections with other emergent groups. Over time these informal networks will also increase their “voluntary” interactions with managers in pursuing organizational goals and objectives as depicted by the overlapping area of the two circles in Figure 1. The overlap is a very desirable state where the formal arrangements and the informal networks both agree with the overall organizational requirements. These agreements don’t come through formal negotiations. Rather they are attained through the natural outgrowth of mutually beneficial day-to-day interactions, or circular causality. I’ve labeled this place this pace of common agreement as the “organizational sweet spot.” Interestingly, it is in the sweet spot where most of the productive work and the generation of new ideas take place in every venture. We need to realize, however, that the two sides displayed in Figure 1 can never completely overlap even though members of both the formal and informal factions heartily partake in joint deliberations. The reason for that is quite simple. Neither side is fully capable of understanding “exactly” how the systems, processes and technology used for producing a product or providing a service needs to function optimally. There is always room for new or broader perspectives. The main thing to keep in mind is that the larger the sweet spot the more sustainable an organization will be in the long-run. Elin Whitney-Smith has spent the past 30 years investigating economic progress as a series of information technology disruptions. She is also the founder and president emeritus of Netalyst, an Internet consulting firm specializing in the interface between social systems and technology. According to Whitney-Smith, the current digital revolution is only the sixth time since the dawn of modern humans that our social systems have faced a monumental change prompted by an innovation in information technology leading to new forms of organizations. Further, she stipulates that an information revolution isn’t always associated with new forms of information technology. It’s mostly about “how” information is used in a particular culture. Invention of the printing press. I propose that each of these major periods of information technology change not only determined how information was used to hold together a culture but also, from a macro perspective, set limits as to how much the organizational sweet spot could be expanded within representative social institutions of a given period. Let me elaborate. According to my research and that of Whitney-Smith our hunter-gatherer ancestors lived in the purest information sharing culture that has ever existed among modern humans. We should not forget that our kind survived and evolved in that manner for roughly 200,000 years before the advent of agriculture about twelve thousand years ago. Clearly, it was a highly effective survival mode to have enabled our kind to come this far. In fact, it’s still the approach we prefer to follow given the appropriate cultural context. Lived in relatively small very interdependent groups composed of kin and close friends. Maintained high, sustained levels reciprocity, egalitarianism, and practiced consensus decision-making. Clan members owned their own means of production. Respected individual autonomy and self-reliance tempered with social responsibility and accountability. Practiced situational or shared leadership based on expertise (social attention holding power) rather than rank (resource holding power) and there were no status differences between the sexes. The five success factors were vitally important for the hunter-gatherers for two primary reasons. First, they lived in small groups. The principle social unit was the band usually consisting of less than 30 people. Bands belonged to a given tribe that rarely had more than 150 members. Essentially, the foragers lived in social groups where everyone knew where they had been, what needed attention at the moment, and where they needed to be heading next. There was no need for secrets. So, it’s not surprising that current research provides strong evidence that humans are physiologically limited in developing and maintaining resilient mutually beneficial voluntary collaborative relationships in groups exceeding the average size of our earliest ancestors. Hence, humans are innately supportive of one another as long as they have at least occasional face-to-face interactions within a non-threatening social environment where individual contributions and not rank is respected. Fundamentally, such social contexts consist of individuals who express a mix of both moderate self-interest and outward reaching altruism. The second reason for the importance of the five success factors cited above was that the hunter-gatherers were extremely mobile. They seldom stayed in one place for more than two weeks and traveled on foot up to 2,500 miles a year within a large seasonally changing territory. Their lives, being fully dependent on the uncertainties presented by nature required extensive practical knowledge, persistence and courage. Further, food couldn’t be stored for much more than 48 hours and due to their mobility personal items amounted to only to what each individual could carry on their person. Also, no one could hide his or her non-participation in a small group’s activities when everyone was out in the open. Clearly, this meant that hoarding of resources was neither possible nor desirable which avoided the accumulation of wealth leading to rank, power and social stratification. Basically, the success of our earliest contemporary ancestors depended almost exclusively not on what they owned but what they knew about the intricacies of their immediate environment. The hunter-gatherer culture had no inorganic structural restraints or a hierarchy. Instead its whole focus was on maximizing information gathering and distribution. Thus status (not to be confused with ranks) was not based on possessions, but on the depth of one’s practical knowledge. Accordingly, their world view was based primarily on sharing information, not in the accumulation of goods. 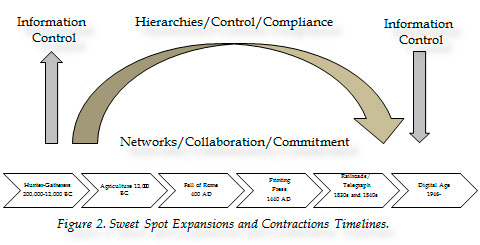 The forager’s sweet spot rather than being depicted by the overlapping area of the two circles, as shown in Figure 1, consisted almost entirely of one sphere representing both the informal social system and the sweet spot. That is, their sweet spot was expanded to its maximum limits and was only restrained by the impossibility of having “complete” agreement/understanding among all members of a band or tribe in the interpretations/perceptions of a given situation. There was no social control of information as depicted by the bottom of the information control arrow and the beginning of the outsized arrow on the left side of Figure 2. This is an extremely important fact to keep in mind because the current Digital Age may give us the opportunity to at least partially duplicate the “purity” of the pre-agricultural information sharing culture and its protracted success factors. That, of course, primarily depends how enamored we are with our material goods rather than the meaningful and mutually beneficial information that we can share with each other. Next I will briefly summarize the impact of the other information revolutions on the expansion or contraction on societal sweet spots. My intent is not to downplay the importance of the information flow phases that followed our lengthy hunter-gatherer existence. Rather, I want to contrast the different eras of information control that ensued and their impact on the welfare and productivity even on our current social systems. Essentially, the basic question is, “How much are we willing to learn from our past in enhancing our natural versus artificial societal success factors?” Put another way, “To what degree are our top movers and shakers intent on holding onto the established hierarchical structures rather than seriously exploring ways to expand organizational sweet spots in their spheres of influence. History, of course, is replete with examples of the social elite desperately holding unto their positions of power as long as possible. The advent of agriculture and the domestication of livestock was the next information technology revolution. As I’ve written before, the changes happened very slowly. After the last Ice Age (110,000 to 10,000 years ago) with the gradual flooding of the coastal lowlands and rapidly spreading forests the hunter-gatherers were constrained to smaller and smaller geographic areas and, therefore, became less mobile. As travel became more restricted and demanding, populations also increased in these enclaves. This, in turn, led to the founding of agriculture and the domestication of animals. Thus, the stage was set for the proliferation of increasingly larger and more complex organizational frameworks. As individual tribes grew to more than 150 members, three principle factors contributed to the emergence of hierarchies or social stratification. One was the ability to produce and store excess food and other resources brought about by the introduction of farming. The second was the permanent settlement of productive land areas and with the introduction of property ownership and its defense. The third factor was the increased size of the population centers that made it impossible for people to be well acquainted with everyone, to practice consensus decision making, or to coordinate important community wide activities face-to-face. As a result, reciprocity and consensus decision making on a community wide basis faded away and were gradually replaced by all-encompassing formal social structures headed by the more affluent members of the society. In addition, specialization of work and division of labor became increasingly necessary in supporting these large centralized populations. As a consequence, most people no longer owned their own means of production and became dependent on more prosperous individuals and institutions. Predictably, before long position power and class differences became prominent and widespread. In fact, the new social order didn’t penalize people for being selfish. It actually encouraged it. People gradually transitioned away from a pure shared information culture to one dependent more and more on owning material goods. Except for the few elite classes of people—monarchs, military leaders and heads of churches—life was generally harder than in the former hunter-gatherer networks. Tending to crops and animals was grueling work. Meals may have been more regular but the diet was much less balanced and less nourishing. Diseases also lurked around every corner since people and animals lived more closely together. The required central administration and defense of city-states and later large empires eventually brought about the invention of counting and writing. Hence, from about 3,500 B.C. onward writing has dominated the world stage. Unfortunately, at first in conjunction with hierarchical administrative structures, writing actually restrained rather than expanded the societal sharing of information as portrayed by the curvature of the oversized arrow in Figure 2. As a result, most organizational sweet spots were also constrained. The fall of Rome initiated the third information revolution. In the political shift of the Middle Ages the Catholic Church acquired most of the power in everyday affairs. Of course, the monarchs and their associated military arms didn’t fade away. They became more regional and lacked the larger territorial control that the Church attained with the fading away of the Roman Empire. As a result, bit by bit more information began to trickle down to the masses. The view of labor was also changed by the Church. Work became a virtue instead of something only reserved for slaves or the down trodden. Commerce increased and in cities, craftsmen formed diverse trade associations or guilds. Typically the guilds were founded by free independent master craftsmen. Interestingly, the guild system was also responsible for the rise of universities at Bologna, Paris and Oxford around 1200. Accordingly, information became accessible to many more people across the social spectrum and not just the elite. This added significantly to the impetus of innovation and business expansion. Regrettably, the organizational sweet spot still remained fairly constrained since governance still remained a top-down affair even within guilds. The next information revolution came about with the invention of the printing press in 1440. As a consequence, many small feudal principalities were consolidated into large states ruled by kings because the newly centralized governments could now more effectively administer larger geographical domains. The printing of maps also brought about a major emphasis on worldwide exploration. People also began to see the world in more standardized forms. Later, the Protestant countries of northern Europe lifted many of the restrictions on printing posed by the Catholic Church in the South. Hence, in no time rivalry among publishers in the North soon resulted in a flood of publications hitting the market. Therefore, we can conclude that the printing press promoted sufficient literacy among the members of the craft-producing classes that it finally allowed innovation to start to rise from the bottom up. In addition, as information became less controlled it in turn stimulated the expansion of organizational sweet spots in many more enterprises which eventually led to the Industrial Revolution. The invention of the steam engine was critical to the development of the modern railroad and trains and the fifth information revolution. In 1803, a man named Samuel Homfray decided to fund the development of a steam-powered vehicle to replace the horse-drawn carts on the tramways. Richard Trevithick (1771-1833) built that vehicle, the first steam engine tramway locomotive. For practical purposes we can say that railroad systems emerged in the 1830s. It was quickly followed by the telegraph in the 1840s which became closely linked to the railroads since the telegraph connections were needed to coordinate train schedules. Suddenly, there was a downward trend in the control of information. I t was now possible, although to a limited extent, for the lower ranks to have input to important management decisions. In the process, the formal and informal social systems could overlap more and more and significantly enhance an organization’s innovative dynamics. Overall, however, it was just the tip of the iceberg that still lurked below. We still needed to wait for the Digital Age to allow us to begin dismantling the inorganic hierarchy. Whitney-Smith uses 1957 as the start of the digital revolution. I like to use 1946 as the starting point. It was the year when the first computer, ENIAC, was accepted by the US Army to calculate artillery firing tables. That, however, is a moot point. I still remember in 1965 as I was working on my MBA at Syracuse University that “scientific management” with the support of sophisticated computer systems was going to solve most business problems with the speed of light. Essentially, management could be run on auto-pilot. Of course, we all know what has transpired since. The Digital Age gave birth to the Internet and varied platforms for the creation of worldwide self-organizing virtual collaborative networks. This gives us the capability again to work in small “bands” and “tribes” which in turn can be connected globally. Thus, we have a golden opportunity to once more be able to expand our sweet spots to the maximum extent possible in all spheres of our social domains. I’m not suggesting anything utopian. The pre-agricultural hunter-gatherers were not “noble savages,” as some anthropologists tried to portray them in the past. Like us, they also could and did resort to violence (our most basic evolutionary survival mode) when that was perceived to be the most appropriate option. Like us, they were not saints by any means of the imagination. So what have we learned from the past? The Digital Age is beginning to show us what is possible with unrestrained information flows and intense collaboration in the attainment of mutually beneficial goals. Are we smart enough to take full advantage of that opportunity? More precisely, do we have the will to allow our selfish evolved predispositions to be outweighed by our egalitarian side? It’s going to take a lot of courage to create a culture that is very similar to our ancient hunter-gatherer past but I think it’s definitely worth the effort. Even though the quest is in our DNA, our post hunter-gatherer past paints a more pessimistic picture. I’m still hoping for the best. Charles (Kalev) Ehin is an author and recognized innovation dynamics and management authority. He is emeritus professor of management at Westminster College in Salt Lake City, Utah, U.S.A. where he also served as the Dean of the Gore School of Business. His latest business book is The Organizational Sweet Spot: Engaging the Innovative Dynamics of Your Social Networks (Springer, 2009). His website is: UnManagement.com.